Charley was known for being a hard working and honest man, who rarely lost his temper. He loved farming. He raised sorghum and had a mill where he crushed it. He then gave it away to family and neighbors. Charley and Ruby always had a large garden and raised big hubbard squash. Doris remembers it being so big they had to cut it with an ax. She said each group of the family would take a piece home to bake. His daughter-in-law Doris has said that he and Ruby helped to support her and her kids when the family was going through a difficult time and she isn't sure how she would have made it without their help. Like most rural farmers, he wore overalls and work shirts on a daily basis. The only time he dressed up was when he was going to a funeral and only then would he wear dress pants and a white dress shirt. Charley was a gifted fiddle player. His talent allowed him the opportunity to play country and western music at barn dances, house dances and family gatherings. He liked to listen to the radio for the daily weather report. He once visited Byron down south when he was in boot camp (Fort Knox? ), but otherwise was a homebody. He never saw the need for a tractor and never thought he would have one, but he eventually came around and got one late in life. Charley often drank soda water to help settle his stomach. He later died of some type of gastrointestinal cancer. Towards the end, he got very sick and ended up in the Boscobel Hospital, where he later died. 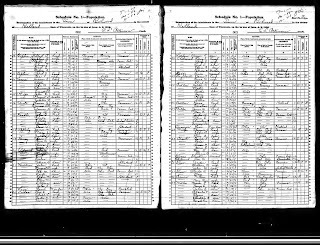 The 1900 US Census is the first record I have that shows Charles. 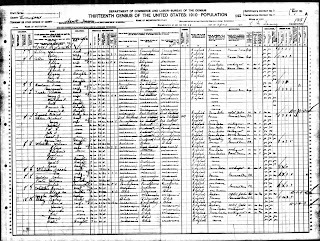 In this document he is listed as the 8 year old son of F. Marien Miller and Ellen J Miller. 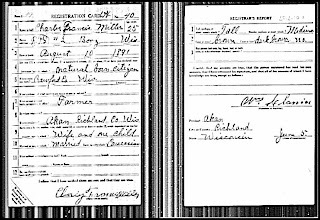 The family lived on a rented farm in Richwood, Richland, Wisconsin. Charles has two siblings, John E (10) and Elzora (5). 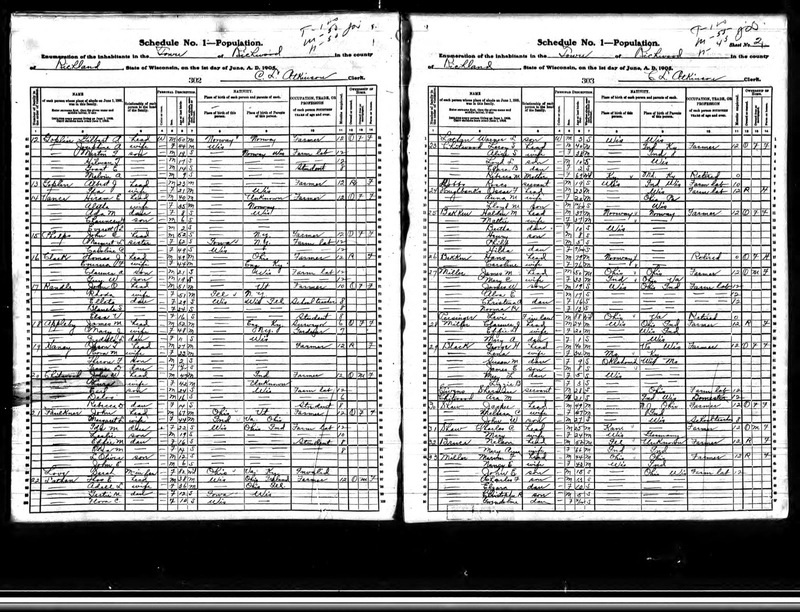 The 1905 Wisconsin State Census shows Charles and his family again living on a farm (haven't been able to confirm if it was the same farm) in Richwood, Richland, Wisconsin. Two other siblings have joined the family putting their ages at: John (15), Charles (13), Elzora (10), Christopher R. (5), and Gwendoline (4 months). 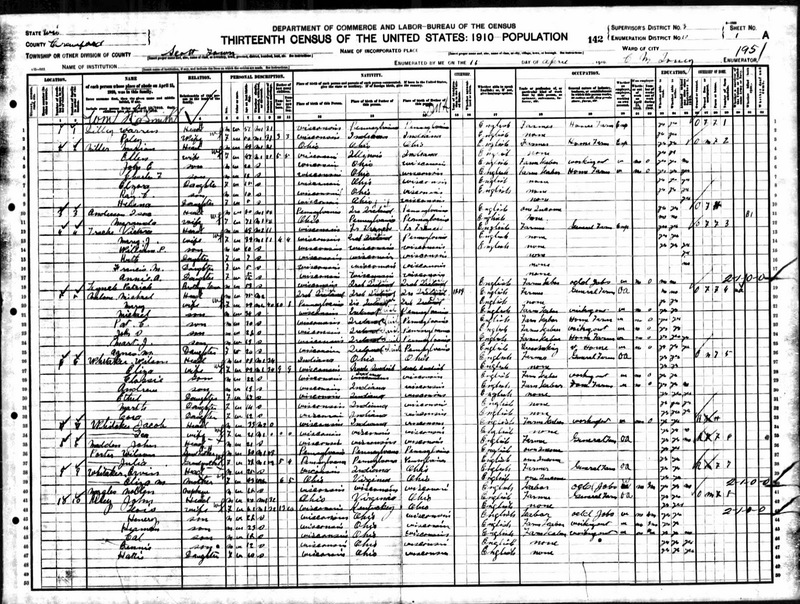 The 1910 US Census shows that Charley and his family have moved from Richland County to Crawford County, residing in Scott Township. 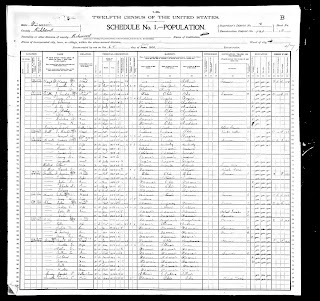 Charles is now 18 years old and the census tells us that he could read and write and he was working as a farm laborer. His family had expanded with another sibling, named Helena. 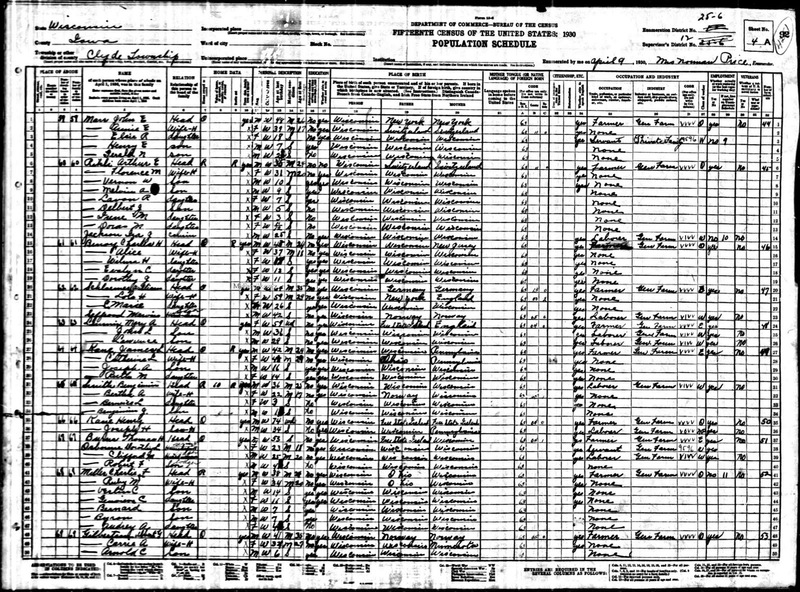 Gwendoline is not listed in this census. 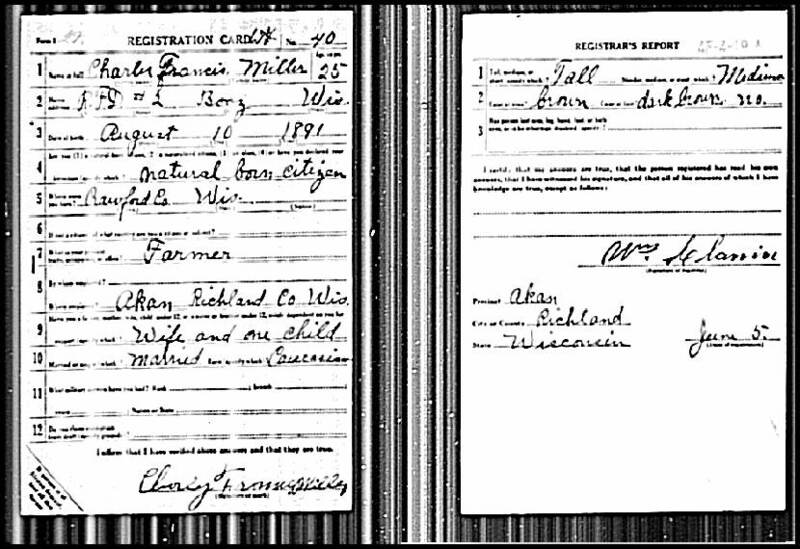 According to Ruby's obituary, on August 11, 1915 she married Charles Francis Miller in McGregor, Iowa. 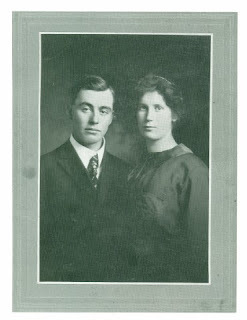 The photo below was taken on their wedding day. My maternal Grandmother displayed this photo for years in her house. I always liked it, but only recently learned that it was their wedding photo. On March 31, 1916, Charles and Ruby welcomed the birth of their son Verlin Crawford Miller. On November 7, 1918, Charles and Ruby welcomed the birth of their daughter Genevieve Miller. 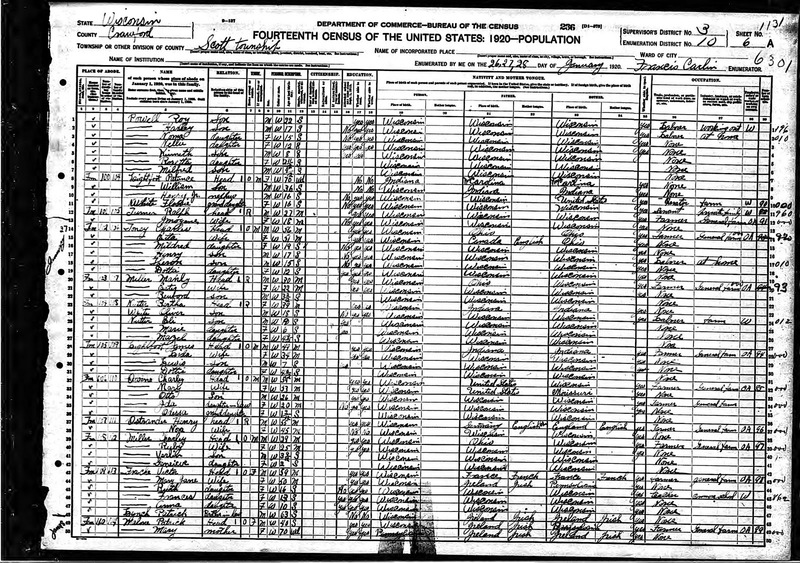 The 1920 Unites States Federal Census shows Charles and Ruby living in Scott, Crawford, Wisconsin. 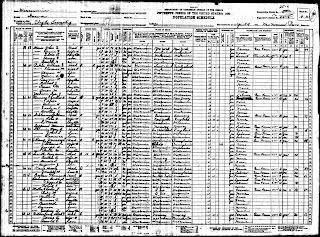 Charles and Ruby have two children in this Census, Verlin (3) and Genevieve (2). On September 30, 1922, Charles and Ruby welcomed the birth of their twin sons Bernard and Byron Miller. 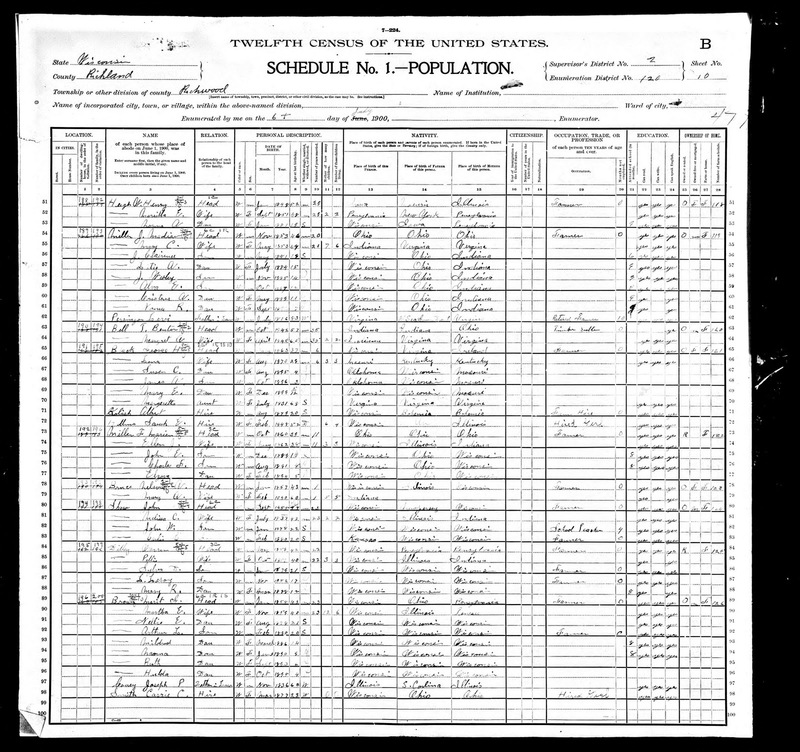 Charles and Ruby moved between the 1920 and 1930 US Censuses. 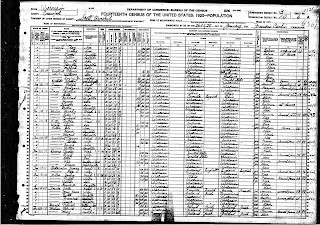 The 1930 United States Federal Census finds them living in Clyde, Iowa, Wisconsin. During this time, Ruby became pregnant two more times. The first pregnancy resulted in twins Bernard and Byron, and the second, daughter Audrey. Charles died of cancer in 1954 at the hospital in Boscobel, Grant, Wisconsin. Charles and his wife Ruby share a headstone in Haskins Cemetery, Richland County, Wisconsin. 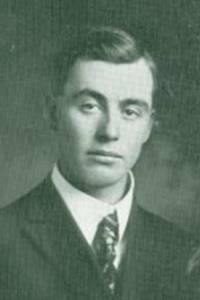 By looking at his photo, Charley appears to be the sort of person who wore suits and ties most of the time--an attorney or a teacher. It would be interesting to see him in his overalls and workshirt. Love what you're doing here. Been following you on Twitter and just came across your blog tonight. I remember taking trips with my father and uncle when I was a child to research and find out about my ancestors. I've just recently become interested again in it except not I'm going to my family's roots in Scotland and England this summer to find out.